On today’s video, I’ll show you how to make these quick and easy Halloween Candy Treat Boxes. 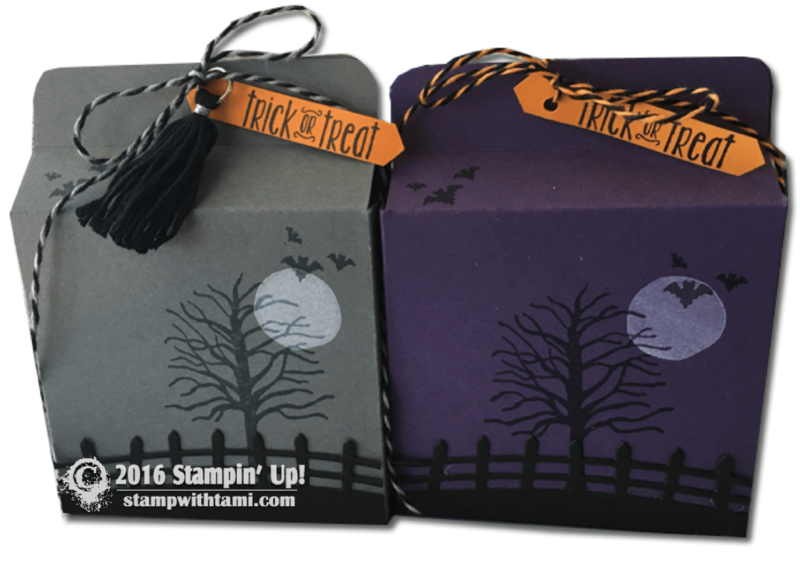 They feature new Stampin Up Holiday Catalog products: Halloween Scares & Spooky Fun stamp sets, Mini Tassels, Halloween Night bakers twine and the new Halloween Scenes edgelits for the fence. Perfect for handing out Halloween treats, party favors, grandkids and school treats. On the video I shared a tip for storing the die brush foam pad and brush in a Stampin Up 1/2 size case. Here’s what I used. These are adorable – I will be making these for party favors for my Halloween party! Tami, I am a secret follower. LOL. I watch your YouTube videos all the time. But I just had to get on here and say how much I loved these little boxes! Such a cute idea. Thank you. OMG too darn cute. My kids will love this for their school party.